BluDomain Is Giving Away 10 FREE Websites and each winner also gets a surprise from one of my famous websites on Tuesday March 27th. Why? Because it's Customer Appreciation Week. March 26th through March 28th. How do I win? By entering one of our contests. Do I have to be a Blu customer? No we love and welcome everyone. How many contests can I enter? You can enter as many as you would like. However you can only win one. Contest A - Send us a photo of you holding a sign that answers this question "Why I do what I do?" Contest B- We want a picture of the "inside" of your refrigerator. Make sure there is lots for us to see! You must send in a self portrait also. Two pictures must be sent in for this contest. Contest C- We want to know what kind of gum you chew! Send us a photo of you holding your favorite PACK of gum. The brand must be visible. Contest D- Take a photograph of someone over 21 holding a sign that says "what they do as an occupation" For example it could say "I cut hair for a living" or " I'm a technical engineer at Lowry Air Force Base" The photo MUST be in black and white and the person can't be in the photography industry. Contest E- Send us a photo of your kids (all of them) sitting on the hood of your car. Contest F- Bake a cake and on the cake in BLU frosting write your birthday. It must be written in numbers. Such as 9-22-67. Send us your self portrait also. Now this is a tough one because you have to bake but I'm here to challenge you! Contest G- I want to see you guys in a tee & jeans. Or women find me a man and photograph him in a tee and jeans. (he can be your husband if need be) He must be holding a sign with his FIRST name ONLY! Contest H- Send us a self portrait of yourself must be in BLACK and WHITE and recent. Contest I- We want to see your couch. Take a photo of your couch ONLY! One contest we will PICK 2 WINNERS! A quick question about Contest H - how recent is recent? A couple of weeks? A couple of months? Within the past year? Thanks! I am in on this for sure. Been checking out your templates for a couple weeks now. Is it just one entry per contest? Great contests! I was a little confused by the deadline you posted - is it suppose to be Monday March 26 or Wednesday, March 28? I don't have a blu domain website yet, but I plan on entering as many of these contests as possible to get one. They're great and very reasonable. I like how your Customer Appreciation WEEK is 3 days. haha. Anyway, I'll email you the photos when they're done. Hey I'm trying for a few or maybe all of these. 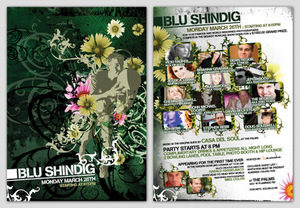 I haven't gotten my blu shindig in the mail yet though. Hopefully it will be here by tomorrow. If it is not, does that mean I can't come to the party?